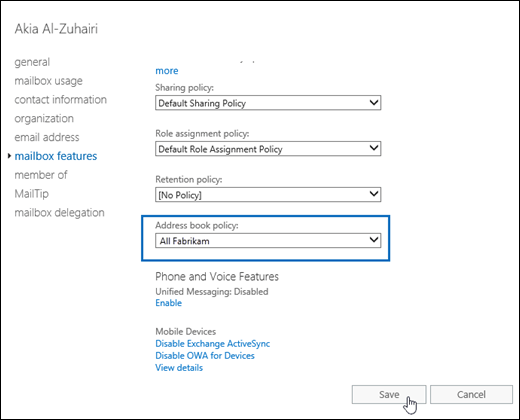 Address book policies (ABPs) allow you to segment users into specific groups to give them customized global address lists (GALs) in Outlook and Outlook on the web (formerly known as Outlook Web App). For more information about ABPs, see Address book policies in Exchange Online. Users aren't automatically assigned an ABP when you create mailboxes. If you don't assign an ABP to a mailbox, the GAL for your entire organization is visible to the user in Outlook and Outlook on the web. To identify your virtual organizations for ABPs, we recommend that you use the CustomAttribute1 to CustomAttribute15 attributes on mailboxes, contacts, and groups, because these attributes are the most widely available and manageable for all recipient types. For more information, see Scenario: Deploying Address Book Policies. To assign ABPs to mailboxes, you select the ABP in Exchange admin center (EAC), or specify the ABP in Exchange Online PowerShell. By default, the Address List role isn't assigned to any role groups in Exchange Online. To use any cmdlets or features that require the Address List role, you need to add the role to a role group. For more information, see Modify role groups. Scroll through the list of mailboxes. Click Search and enter part of the user's name, email address, or alias. Click More options > Advanced search to find the mailbox. Once you've found the mailbox that you want to modify, select it, and then click Edit . On the mailbox properties page that opens, click Mailbox features. Click the drop-down arrow in Address book policy, and select the ADP that you want to apply. Click More options > Advanced search. In the Advanced search window that opens, select Recipient types and verify the default value User mailbox. Click More options, and then click Add a condition. In the Select one drop-down box that appears, select the appropriate Custom attribute 1 to Custom attribute 15 values that defines your virtual organizations. In the Specify words or phrases dialog that appears, enter the value that you want to search for, and then click OK.
Back on the Advanced search window, click OK. 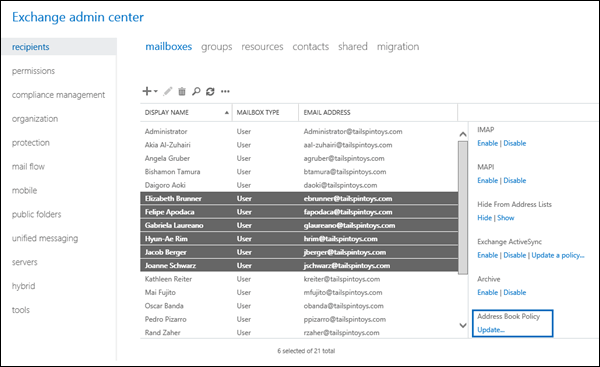 In the EAC at Recipients > Mailboxes, click More options > Advanced search to find user mailboxes. Select a mailbox, hold down the Shift key, and select another mailbox that's farther down in the list. Hold down the CTRL key as you select each mailbox. After you select multiple mailboxes of the same type, the title of the details pane changes to Bulk Edit. In the details pane, scroll down and click More options, scroll down to Address Book Policy, and then click Update. In the Bulk assign address book policy window that opens, select the ABP by clicking the drop-down arrow in Select Address Book Policy, and then click Save. This example assigns the ABP named All Fabrikam to the mailbox joe@fabrikam.com. Filter mailboxes by attributes: This method uses the unique filterable attribute that defines the virtual organization (for example, the CustomAttribute1 through CustomAttribute15 attribute value). This example assigns the ABP named All Fabrikam to all mailbox users whose CustomAttribute15 value is FAB. This example assigns the ABP policy named All Fabrikam to the mailboxes specified in the file C:\My Documents\Fabrikam.txt. $Fab = Get-Content "C:\My Documents\Fabrikam.txt"
For detailed syntax and parameter information, see Set-Mailbox and Get-Mailbox. In the EAC, go to Recipients > Mailboxes, select the mailbox, and click Edit . In the properties of the mailbox window that opens, click Mailbox features, and verify the ABP in the Address book policy field. To remove the ABP assignment from a mailbox, you select the value [No Policy] in the EAC, or use the value $null for the AddressBookPolicy parameter in Exchange Online PowerShell.